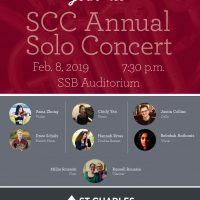 Talented local musicians – one as young as 12 years old – will be featured at the St. Charles Community College Annual Solo Concert at 7:30-9 p.m. Friday, Feb. 8. The performance, which is free and open to the public, will showcase brass, percussion, piano, string, voice and woodwind instruments in a variety of songs. 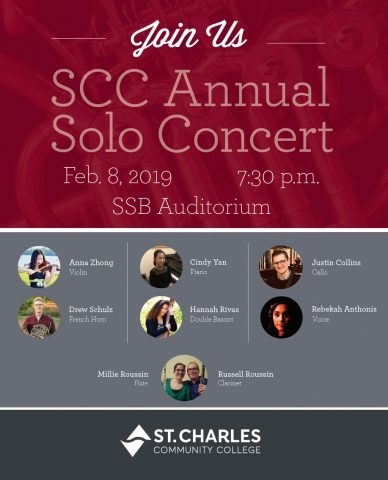 Watch as Anna Zhong (violin), Cindy Yan (piano), Justin Collins (cello), Drew Schulz (French horn), Hannah Rivas (double bass), Millie Roussin (flute), Russell Roussin (clarinet) and Rebekah Anthonis (voice) perform on their chosen instrument. The concert will be held in the auditorium of the Daniel J. Conoyer Social Sciences Building.